What Are The Main Triggers Of Eczema? There are many triggers of eczema that can cause an outbreak. There are suggested reasons to why someone first gets eczema. But there are many things that can cause a reoccurring flare up. Every eczema sufferer will have a different combination of things that are a problem for them. I have complied a list of the most common triggers of eczema. Though in reality the list could be endless, as everyone's skin is different. The best way to first recognise if something is a cause of eczema is to notice when any symptoms first appear. 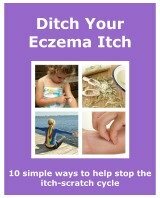 Finding the triggers of eczema is so important in helping to reduce the number of outbreaks you have. This in turn helps to prevent minimize further skin damage. The first obvious thing that can be done is to avoid the offender. At first this can sound simple. Then we start to realise that whatever we need to keep away from is in things we never thought of. Having a Pet Dander Allergy could also be one of the common eczema causes. Contact with furry and feathered animals can be an irritant. The caring of an animal and where they live could also be a factor. If precautions are taken then you, your skin and your pets can live in harmony.